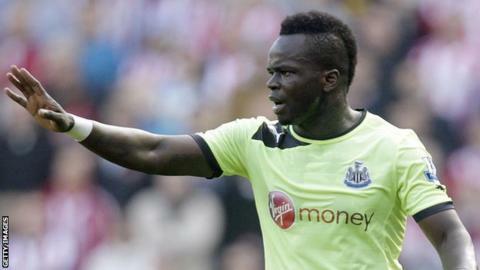 Newcastle manager Alan Pardew has told midfielder Cheick Tiote he needs to improve his poor disciplinary record. The Ivory Coast international was sent off in the 1-1 draw with Sunderland on Sunday and he has received 29 bookings in 59 games since joining the club. "It's not a laughing matter because he's one of our big players and I can't have him not playing," Pardew told BBC Newcastle. "It could be costly and he needs to understand that." Tiote's red card against Sunderland was the second sending off of his Newcastle career. He will miss Newcastle's next three Premier League matches but is free to play for the club in the Europa League and will be involved against Club Brugge on Thursday. Pardew has revealed that he reminds Tiote about his responsibilities before every match. "I will be talking to him before the Brugge game," he added. "We talk to him before every game. We talk to him at every half-time and I'll be talking to him again." Last season the 26-year-old received more bookings than any other player and he has already picked up four yellow cards and a red in seven matches this season. Pardew accepted the decision to dismiss Tiote for his tackle on Sunderland striker Steven Fletcher, but feels the game is losing its physical side. "I do think that part of the game has changed," he continued. "Where we are at the moment is that almost every mistimed tackle is a booking. "There is going to be this type of challenge. Referees need to understand that it's a genuine attempt to get the ball and nothing more. That's why we devised this award for a free-kick. It's not always a yellow card. "So the sanitisation of the game is a little bit worrying for me because I like the physical side. I think we all do as supporters."